Former Spice Girl Emma Bunton (Baby Spice) celebrated her 40th birthday Thursday on her Heart London radio show. As part of the celebrations, Emma ticked off one of her bucket list dreams: presenting the radio show from the comfort of a bed. Much to Emma’s delight, co-host Jamie Theakston surprised her by arranging for a bed to be set up in the Heart studio. Throughout the show, birthday wishes came from famous friends including Geri Halliwell, Ant & Dec and Keith Lemon. Geri Halliwell – "Happy birthday darling, it’s Geri. I hope you have an amazing day, can’t wait to see you later. Yeah you’re 40 but you’re still my little sister and I love you dearly. 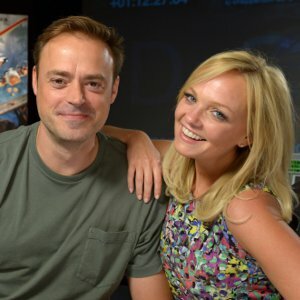 Big kiss"
Tune in to Jamie Theakston and Emma Bunton on Heart London Breakfast, weekdays from 6am – 9am.